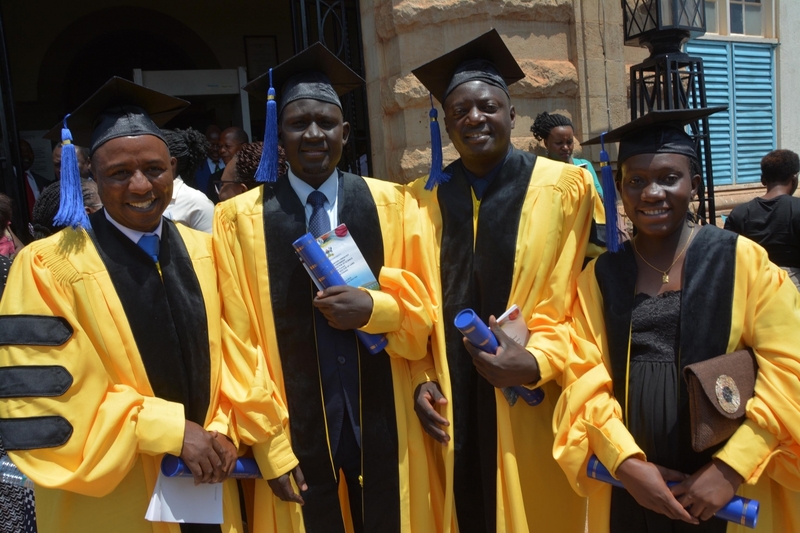 First graduating class of the East African Pediatric Hematology and Oncology Fellowship Program (L to R): Dr. Barnabas Atwiine, Dr. Fadhil Geriga, Dr. Philip Kasirye and Dr. Ruth Namazzi. Dr. David Poplack with the graduating fellows and Pediatric Hematology and Oncology team. NEW YORK, HOUSTON, and KAMPALA, Uganda, August 27, 2018 /3BL Media/ – The Ministry of Health of the Republic of Uganda, Makerere University College of Health Sciences, East African Community, Uganda Cancer Institute, Baylor College of Medicine Children’s Foundation- Uganda, Mulago National Referral Hospital, the Bristol-Myers Squibb Foundation, Texas Children’s Cancer and Hematology Centers and Baylor College of Medicine International Pediatric AIDS Initiative at Texas Children’s Hospital (BIPAI) celebrate the graduation of the first class of the East African Pediatric Hematology and Oncology Fellowship Program at Makerere University College of Health Sciences. The East Africa Pediatric Hematology and Oncology Fellowship Training Program is the result of cooperation and commitment between some of the most eminent institutions in Africa and on the world-stage in cancer care, medical education, health policy, and pediatric hematology and oncology. As part of the comprehensive Global HOPE (Hematology-Oncology Pediatric Excellence) initiative, which launched in February 2017, the two-year fellowship program is building a critical mass of pediatric hematology-oncology specialists to independently provide effective, evidence-based pediatric cancer and hematology care in the African setting. In the United States, 80 percent of children with cancer survive. In sub-Saharan Africa, the overwhelming majority of pediatric patients do not. The mortality rate is estimated to be as high as 90 percent, meaning that thousands of children die from cancer across Africa each year, with the most common types of childhood cancers being blood cancers, including leukemia and lymphoma. Most childhood cancers are treatable. However, up until this point, the main reason for the staggering death rate across Africa has been due to an inadequate health care infrastructure and a significant lack of expert physicians and other health care workers trained to treat children with cancer and blood disorders. With the ambitious efforts of Global HOPE to build medical capacity to diagnose and treat pediatric blood disorders and cancer in Africa, the impact is already evident in the higher numbers of children receiving care in Uganda, Botswana and Malawi. At the graduation ceremony, Dr. Poplack was awarded an Honorary Doctor of Science, DSc. (Honoris Causa) from Makerere University for his academic contribution in the field of science. Under his leadership for the last 25 years, Texas Children’s Cancer and Hematology Centers established itself as an internationally-recognized leader in the treatment and research of pediatric cancer and blood disorders. With a desire to expand care to areas of the world with limited resources, Poplack and his team have worked over the last decade to provide care to children in sub-Saharan Africa. With the inception of Global HOPE, access to care will only continue to increase with this training of pediatric hematology-oncology physicians through the fellowship program. Barnabas Atwiine, MB ChB, MMed. (Pediatrics) completed his medical degree and specialized in pediatrics from Mbarara University of Science and Technology (MUST). Prior to joining East Africa Pediatric Hematology and Oncology Fellowship, he was lecturer in the Department of Paediatrics and Child Health at MUST for four years. He was in charge of the pediatric cancer service at Mbarara Regional Referral Hospital. During his Fellowship, he led development of a new combination chemotherapy approach to treat children with Burkitt lymphoma in Africa; and championed widespread use of hydroxyurea to control sickle cell disease in children. He will return to Mbarara to head the children’s cancer service and to initiate a pediatric hematology service. Fadhil Geriga, MB ChB, MMed. (Pediatrics) obtained his medical degree from Mbarara University of Science and Technology, after which he completed training in pediatrics at Makerere University. He served at Uganda Cancer Institute as a general pediatrician for four years before joining the East Africa Pediatric Hematology and Oncology Fellowship. He conducted research that demonstrated the high incidence of muscle cancers of the face that were previously often misdiagnosed as lymph node cancers. He will spearhead development of a world-class muscle and kidney cancer care and research program at The East Africa Center of Excellence in Oncology at Uganda Cancer Institute, under the mentorship of world experts from Texas Children’s Hospital. Dr. Philip Kasirye, MB ChB, MMed. (Pediatrics) obtained his medical degree and specialization in Pediatrics and Child Health from Makerere University. Kasirye has a lot of experience in clinical, community and public health aspects of pediatrics having practiced in various rural and urban settings, including at Mulago National Referral Hospital as Director of the Sickle Cell Clinic for the last five years. During his Fellowship, he oversaw gigantic improvements in the care of children with Sickle Cell Disease at Mulago and formulation of nationwide guidelines of care for which he received an award of excellence from the Ministry of Health. He was requested to lead the Pediatric Cancer and Blood Diseases program of excellence at Kamuzu Central Hospital in Lilongwe, Malawi before returning to Mulago Hospital. Ruth Namazzi, MB ChB, MMed. (Pediatrics) received her medical degree and specialization in pediatrics from Makerere University where she served as faculty in the Department of Pediatrics and Child Health before joining the PHO Fellowship. She led the upgrading of leukemia and kidney cancer treatment protocols that resulted in major improvements in the survival of children with these cancers. She also served as the Chief Fellow for the last two years. She is keen to understand the intricacies of abnormal function of the immune system in children with sickle cell anemia, and how this can be targeted to reduce the acute and life-long effects of this disease. She will focus on research in cancerous and non-cancerous blood diseases, and will co-direct the East Africa Pediatric Hematology and Oncology Fellowship. Global HOPE was developed to create an innovative pediatric hematology-oncology treatment network in southern and east Africa, and build long-term capacity to treat and dramatically improve the prognosis of thousands of children with cancer and blood disorders. 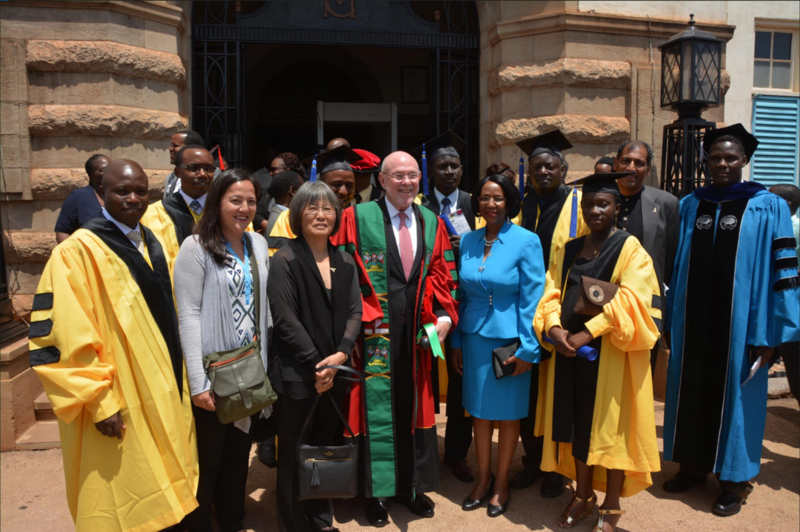 The initiative will train an estimated 4,800 health care professionals from Botswana, Uganda, Malawi and other African countries, including doctors and nurses specializing in pediatric hematology-oncology and social workers. The program estimates that over 5,000 children will receive care in the first five years. Modeled on the work of the Bristol-Myers Squibb Foundation, BIPAI and the Governments of Botswana, Uganda and Malawi, which created the largest pediatric HIV treatment network in the world, leveraging existing experience, infrastructure, and public/private partnerships created through the initiative. Since 2003, the Bristol-Myers Squibb Foundation and BIPAI have trained 52,000 healthcare professionals and currently provide care for nearly 300,000 children with HIV and their families in sub-Saharan Africa, lowering the mortality rate for these children to 1.2 percent. The Bristol-Myers Squibb Foundation is committing $50 million over five years to fund the training of healthcare providers as well as clinical infrastructure and operations. BIPAI will raise an additional $50 million for the initiative. Uganda is located in East Africa and has a population of about 40 million people. Uganda is popularly referred to as the Pearl of Africa. Uganda gained its independence from Great Britain on October 9, 1962. The country spans across the Equator and has a total area of 236,040 square kilometers, roughly the size of England. It is a republic with Kampala being its capital city and Central business district. The nation is a result of the amalgamation of ancient kingdoms, as well as many independent chieftains. Their traditions live on in the hearts of the people, and their traditional costumes, language and practices are clearly identifiable in the life of Uganda today. Uganda is bordered to the east by Kenya, to the north by South Sudan, to the west by the Democratic Republic of the Congo, to the south-west by Rwanda, and to the south by Tanzania. The southern part of the country includes a substantial portion of Lake Victoria, shared with Kenya and Tanzania. Primary industries are sugar, coffee and tea factories, cotton and textiles, fishing, tobacco, cement, soft drinks, plastics, soaps and beauty care, pharmaceuticals, lumber and housing. The leading exports are coffee, fish, and fish products, tea, electricity, horticultural products, vanilla, and flowers. The main imports are capital equipment, vehicles, petroleum, medical supplies, chemical, and cereals. Texas Children’s Cancer and Hematology Centers (TXCH) is the largest pediatric hematology-oncology program in the U.S., treating patients from 35 states and 26 countries. TXCH performs advanced patient care, cutting edge clinical and laboratory research and has largest training program for pediatric hematology-oncology in the U.S. With a staff of renowned experts, the centers have developed a wide array of programs aimed at curing children with diagnoses ranging from the most common to the very rare. The team of 190 faculty and over 1,000 staff have pioneered many of the now standard treatments for pediatric cancer and blood disorders. TXCH has a long-standing commitment to improving global health. For more information, please visit texaschildrens.org/cancer. Christine Namulindwa, +256 706 917 067, Christine.namulindwa@uci.or.ug.